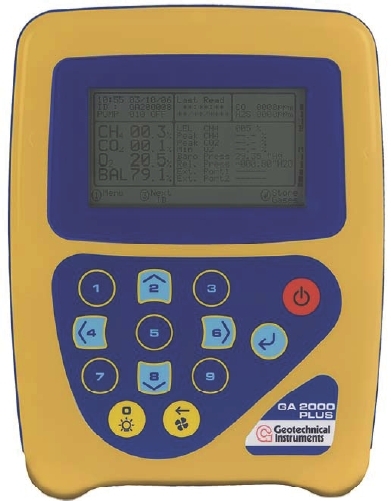 The GA2000 PLUS by Geotechnical Instruments utilises new technology to give even more reliable readings for CO, which can help when trying to determine the presence of fires on landfill. It incorporates all of the existing technology and features of the field proven GA2000 with additional features for specific applications. The analyser monitors Methane (CH4), Oxygen (O2), Carbon Dioxide (CO2), Carbon Monoxide (CO) as standard. A choice of an additional internally measured gas, a hydrogen level indication, ammonia measurement (NH3/H3N) and 0-5000ppm Hydrogen Sulphide (H2S) pod are also available. In addition, the GA2000PLUS landfill gas analyser is able to monitor high and low gas flow as well as pressure and temperature. Site observations and borehole parameters can also be stored on the instrument. This product now has MCERTS certification. The GA2000 Plus and GEM2000 Plus are the first portable landfill gas analysers to achieve this certification. This gives extra assurance that these units perform to the stated technical specification and help even further with making landfill compliance on PPC easier. It may also help you to save future expenditure on additional EA audits, check monitoring and annual subsistence, as it could count towards a higher OMA (operator monitoring assessment) score. The analysers have gone through a long and rigorous test procedure at Sira Environmental, the approved EA certifying body for MCERTS portable gas analysers, to achieve this standard.